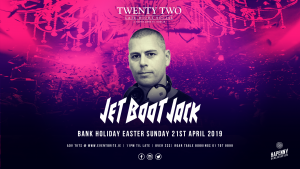 Jet Boot Jack’s custom made bootleg remixes and mash-ups of popular tracks have clocked up over 3 million hits online, earning significant notoriety across the globe. Whether spinning House, Disco, Hip-Hop, Drum’n’Bass, Latin, Soul, Funk, Rock, or a combination of all of the above, he delivers an uplifting party vibe wherever he plays and has shared billing with acts such as The Chemical Brothers, Norman Jay, DJ Yoda, Professor Green, Shift K3y and Fat Freddy’s Drop at venues as varied as Ministry Of Sound, Jazz Cafe, Alexandra Palace, and The Olympic Park. With An Incredible Line Up, Amazing Production…You Do Not Want To Miss This Unforgettable Night !!!! Please call us on 01 707 9899 to book a reserved area.